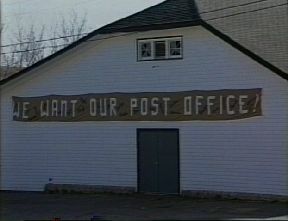 In 1986 after the Canadian Government privatized the postal service, forming Canada Post Corporation it also gave blanket approval to their plan to systematically close 5000 rural post offices. This is one such communities response to this policy of giving corporate profitability priority to providing mandated services. When it came time to announce the closing of the Mabou post office in Cape Breton Island in Eastern Canada back in March of 1991, it was viewed as a "natural opportunity" by Canada Post. Here was a rural community servicing 1,000 residents whose post master had retired a few years earlier and had never been replaced. It was merely a matter of giving notice and assuming that a local store would be willing to take over some of the retail operation. It turned out that Mabou was not such a typical rural community. 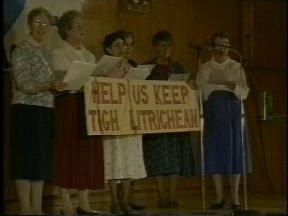 There is a particularly strong sense of heritage here, including the preservation of Scottish music and Gaelic culture. In the 1950's there was an influx of Dutch immigrants who brought modern commercial dairy farming to the area. Many households are self-employed in farming, fishing, business, tourism and the arts. The loss of the post office could be devastating to the local economy. What was to be done? Rallies were held, petitions were signed, letters were sent and in general people organized. There was a town meeting where Canada Post brought in their public relations people to try to pacify the community, rather than to listen to any of their grievances. Instead they were clearly not prepared for the response from the people of Mabou who believe that their postal service was there to serve them not just to make the maximum profit. Despite the fact that the community was supposedly powerless against the Canada Post Corporation, they did manage to work out a compromise after their efforts had generated both national attention and overwhelming support for their protest. Their post office building would not be sold and instead they would be allowed to run it themselves with a community owned, operated and financed corporation. Though in the end there is a victory of sorts, Mabou Fights Back raises many fundamental questions. Is profitability a greater priority than national unity? What about the economic needs of Canada Post versus those of the rural communities it is suppose to serve? Finally, in a democracy what real options do people have in making themselves heard. How does the system really work, and for whom? "An important piece of recent history has been documented by Black River filmmaker Neal Livingston with the release of Mabou Fight's Back. (the film) is the record of one village's refusal to quietly accept Canada Post's arrogant attitude towards its rural responsibilities. With a blend of narration, interviews and recorded encounters between the people of Mabou and Canada Post representatives, Livingston's film captures a proud moment in the life of Mabou." - Frank MacDonald, The Inverness Oran, May 6, 1992.